Posted on May 30, 2018 at 5:33 am. The SOLs roll-on here at WMS — with 8th graders on the Hokie and Patriot teams taking the Math exam. Here’s a look at the testing schedule for May 30th…. 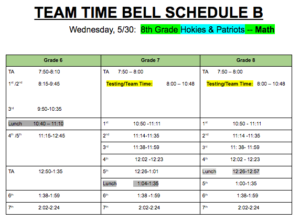 We will be following “Team Time Bell Schedule B.” While the Hokies and Patriots are testing from 8 to 10:48 a.m. — the rest of the 8th grade and all of the 7th grade will go to Team Time, while the 6th grade will follow the adjusted ‘B’ schedule beginning at 8:15. Testing locations are listed on the call-board by the auditorium, or you can check with your TA teacher. And now it’s time for WOLF PACK PRIDE! WMS Spirit Wear t-shirts will be on-sale TODAY and TOMORROW after school at the new School Store. They’re just 10-dollars each — and are the perfect “fit” for either next month’s Field Day event or the 8th grade field trip. And there are still a few grade-level t-shirts available, too — for 18-dollars. So come get your gear at the school store today — and be a Part of the Pride! !